Atal Pension Yojana 10,000 per Month | PFRDA Latest Pension Scheme in Atal Bihari Vajpayee Pension Scheme of Rs 5,000 to 10,000 per month. 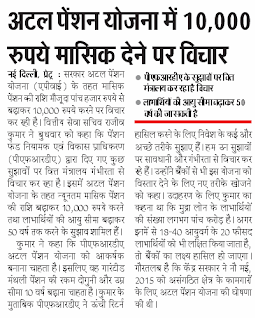 Atal Pension Yojana 10,000 per Month Central Government is going to extend Atal pension Yojana up to 10,000 per month. In this update we have new scheme for those people who saves money to become able in old age time. Shri Narendra Modi Government who is Prime Minister of India has given us many schemes like Beti Bacjao Beti Padhao Yojana, Make Kumbh Mela as an international Tourist place in the world, Ayushman Bharat Yojana for Middle class family and last one which we are talking about is Atal Pension Yojana. 10,000 Per Month Pension Scheme: Talking 10,000 per month in your age of Grand Parents time is perfect way to establish yourself. Because in India, marriage proposal only accepted when groom earn above rs 10,000 per month. 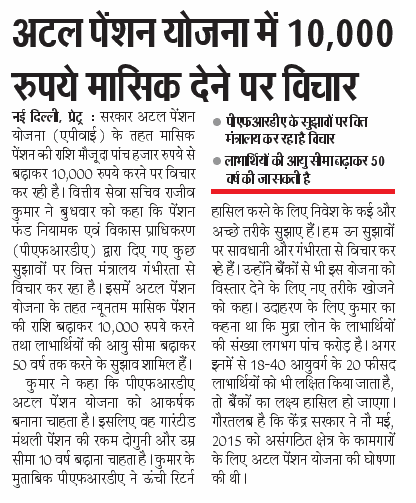 So PFRDA who is popularly called Pension Fund Regulatory Development Authority suggest govt of finance department for making Atal Pension Yojana Minimum Rs 10,000 per Month or change or half pension come money to make as (R 5000+ Rs 5000). PFRDA Pension Scheme of Rs 10,000 Per Month: The two points raised by PFRDA is Age Limit + Rs 10,000 must be extended. 1. Department wants to make Indian Pension Scheme more attractive. 2. Age Limit of Pension Scheme under APY should be 10 years+ which is not 18 to 40 years only. 3. It will benefit mostly to account hold of Provident Fund. 4. Return may also give on last time of ending procedure.